Product cost for a lawn care business is a major expense that - in turn - affects their profit margins. Some of our customers have said how negotiating product pricing with vendors is one of the most crucial steps they take every year, since - in their opinion - a product’s price can vary from 10-20%. That means it’s important you do your homework and plan out exactly what you need. If you do fertilization you know it’s one of those products with a fluctuating price. Additionally, there a plenty of philosophies about fertilizer, from application strategies to mixes to, probably the biggest question: liquid or granular? To answer that, one must take into consideration the cost, storage, equipment and - most importantly - results. The latter not only can save you time and money by reducing the number of applications but it’s also what makes a customer happy and loyal. At the end of the day, that’s what separates an excellent business from an average one. 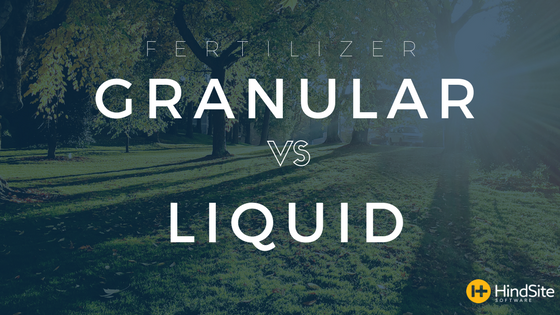 As you’ll see both, granular and liquid, have their advantages and disadvantages. This type of “fertilizer is formulated and packaged as a liquid and includes clear liquids (solutions) and liquids that contain suspended solids (suspension fertilizers).” Explains, professor of soil fertility at Auburn University, Beth Guertal. Nearly Instant Green Up: Nutrients are already in solution, which means they are also immediately available to the plant. While the plant’s root system absorbs most nutrients there’s also a very small amount can be taken in through the leaves - resulting in a quick green-up within days of the application. Combined Fert & Pesticides: Meaning they can both be sprayed on in one pass over the lawn, saving time and money. Weed Treatment Coverage: Liquid application usually has better coverage which can better fight weeds. Depending on spreader settings and a technician's experience, when treating weeds and crabgrass, granular will occasionally miss areas. No clean-up: Just spray and go, saving you plenty of time. Limited Longevity: Since the nutrients are already in soluble form, most of them are readily available to the plant. Since the nutrients are in a soluble form they are a fast-release supply, which initially produces good results but won’t last as long as granular. This leads to more liquid application per season to maintain a lawn’s color. Upfront Equipment Cost: You need to make a significant investment into the necessary equipment to just be to administer liquid applications. Equipment can easily range from $4,000-$18,000. An additional bulk mixing system is required if you plan to mix the liquid prior to distributing to each individual truck. Blanket Pesticide Application: Since they are already mixed with the fertilizer, pesticides end up cover the entire lawn. At times this means applying to unneeded areas and most experts believe this blanket approach hinders overall turf management of a customer’s property. Greater Flexibility: Instead of a "one size fits all" approach, products can be easily substituted or changed to fit the specific needs of a property. You won’t have this freedom if you’re mixing a bulk liquid solution. Longer Lasting: Controlled-release nutrient sources might make the initial green-up to take a little longer, but the results will likely last much longer. Granular can also accomplish more per application. And since the price you end up charging is based on the number of application, you’ll likely end up charging a customer less. Ideal Antidote for Heat Stress & Drought: Although some granular fertilizers can burn lawns if not properly administered, slow releasing granules can be the perfect medicine for lawns battling hot, dry conditions since they slowly feed a lawn - avoiding burning. Seperation of Fert & Pesticides: Since they aren’t tank-mixed together they require two separate trips, however this extra trip increases application thoroughness and means pesticides aren’t applied to areas that don’t require it. Tougher to Scale: For larger operations and businesses that expect to expand their fertilizing services, the more customers you serve, the more granular fertilizer you’ll need and the more difficult it will be to control cost (since it has a higher cost per unit of nutrient) and product consistency. Weed Treatment Coverage Lapse: Depending on spreader settings and a technician's experience, when treating weeds and crabgrass, granular will occasionally miss areas. More Time: Each application can take much more time. This is because you’ll likely take two trips over the property and more time will be spent cleaning up the granules from paved surfaces - sweeping them back onto the turf. There's likely not a single right or wrong answer. Rather, it’s all about choosing the fertilizer that makes sense for your green industry business. That’s not to say you have to just use one or the other - more times than not - the best call is using a combination of liquid and granular fertilizers.